The way China’s currency moves against the dollar could be the best measure of how well U.S.-Chinese trade talks are proceeding. Strategists say the fact the renminbi, also known as the yuan, has steadied against the dollar and is edging higher is one of a number of positive signs that show the Chinese are serious about the trade talks. The currency has been a point of contention between China and the Trump administration, which has said in the past it was intentionally weakened to help Chinese exports. “People think it’s being politicized to help facilitate better trade talks. When the dollar was bid, the RMB did not weaken that much, and today the dollar is softer, the RMB is not strengthening that much. The idea is officials are trying to dampen volatility to help facilitate the trade discussions,” said Marc Chandler, chief market strategist at Bannockburn Global Forex. 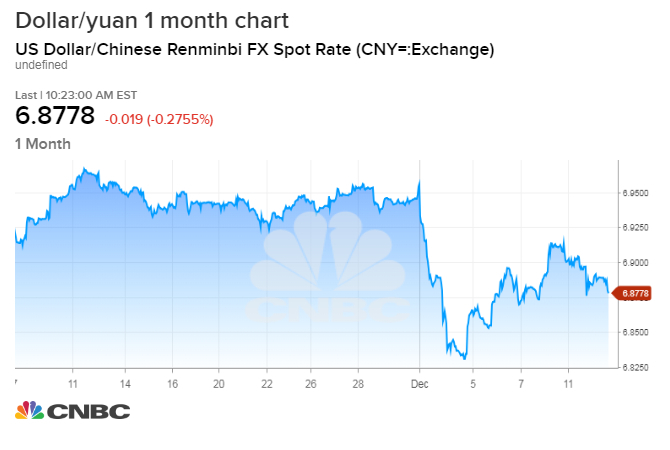 Chandler said the renminbi, also known as the yuan, appeared to become steadier against the dollar, just ahead of the dinner meeting between President Donald Trump and China President Xi Jinping in Buenos Aires Dec. 1. The two leaders agreed to a trade truce and agreed to hold off on further tariffs, while they negotiate for a 90-day period. China also agreed to drop new tariffs on U.S. autos and buy U.S. soy beans. “I think the negotiation is a real negotiation now. It seems like China is trying to deliver something to the negotiating table that’s going to keep the momentum going. They’re trying to deliver something on the currency,” said Jens Nordvig, CEO of Exante Data. China’s central bank sets a daily exchange rate for the yuan based on recent prices, and allows trading against the dollar in a band that could be as much as 2 percent above or below that level. The currency began to move noticeably lower against the dollar as trade tensions rose in the second quarter, but recently China has been deliberate in keeping it from falling. The dollar/yuan pair has moved higher, meaning the dollar gained against the yuan, most noticeably since June when the market began pricing in trade tensions. So far this year, the dollar is up 6 percent, and it could reverse that move.